This Place of Worship was founded in 1183, and we understand it is still open. Kelly's Directory of 1895 describes Beauchief as "now a parish", formerly extra parochial, on the borders of Yorkshire, situated in the vale of the river Sheaf, with a station on the Midland railway, 4 miles south-by-west from Sheffield, 3½ north-west from Dronfield station [also] on the Midland railway. The chapel of St Thomas, "erected in 1660 out of part of the ruins of the abbey, is a small building, with a western tower in the Norman style". The parish records date from 1812 for baptisms, and from 1814 for burials. The living was then a donative and exempt from any ecclesiastical jurisdiction; and there was no fixed chaplain. 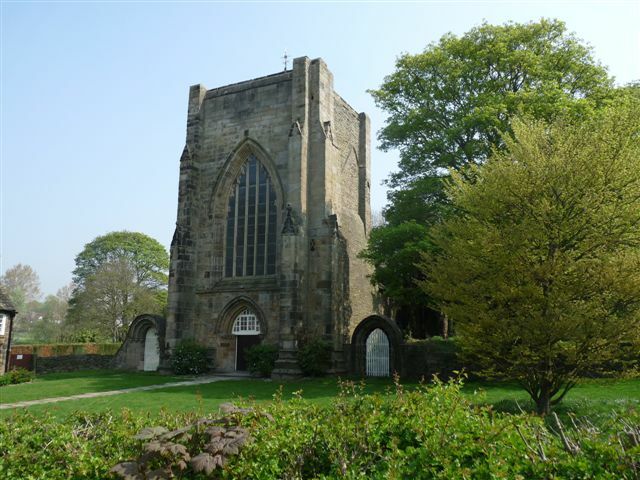 Beauchief Abbey is described separately, as founded by Robert FitzRanulph, lord of Alfreton, Norton, and Marnham (Notts), between the years 1172 and 1176, and assigned about 1183 to canons of the Premonstratensian order, who received their name from Premonste (Premonstratum), a desert valley in Picardy, bestowed upon St Norbert, the founder of the order, by the Bishop of Leon. He was so called, it is said, because he was pointed out by the Blessed Virgin to be head of this reformed order. From the colour of their habit, they were generally known as the White Canons; and (says Kelly) "of this monastic house, dedicated to St Mary the Virgin, some fragments still remain". Bulmer's Directory of the same year goes further in noting that there is an interesting relic of the old abbey preserved at Osberton, Nottinghamshire, the seat of the Foljambes. It is a carving in alabaster representing the murder of Thomas à Becket, which is believed to have been the original altar-piece of the abbey church. Perhaps this is what gave rise to a conclusion reached by Dugdale and others that FitzRanulph founded the abbey because he felt remorse at Thomas à Becket's murder, and so gave land, and his signature to a charter granting the establishment of "an Abbey at Beauchief which would be dedicated to 'God, St Mary, St Thomas and the blessed brethren of Premontre'"; however Bulmer's account disproves this by naming the knights as Reginald Fitzurse, William Tracy, Hugh de Moreville, and Richard Brito. Nevertheless the history of the present chapel has remained inextricably linked with that of the Abbey, as for example in 1851. The return to the Religious Census (HO 129/507/3/1/1) was for "An Abbey Church (or Beauchief Abbey) dedicated to St Thomas à Becket", described as consecrated "about the year 1183", and "in an extra-parochial Liberty, free from ecclesiastical jurisdiction". It had 100 sittings, all free, and its average congregation was 30 in the morning, and 60 in the afternoon, with 20 Sunday Scholars, for a service which was "alternatively in the morning and afternoon". The return was completed by John Cockerton, M.A., Chaplain, who gave his address as "Grammar School, Dronfield, Derbyshire". Perhaps as befitting a schoolmaster, his handwriting on the return was excellent - very easy to read. As an aside, according to Kenneth Cameron, in The Place-Names of Derbyshire (1959), Beauchief "is a typical French name for a monastic site 'the beautiful headland', from Old French beau (v. bel) chef, cf. Beachy Head (Sussex). The abbey was situated near a hill-spur". 'Beauchief' is pronounced locally as 'Beech-iff' ('Beech' as in tree), and with emphasis on the first syllable. Typically, Derbyshire dialect swallows the last syllables of words. The parish was transferred to the City of Sheffield in 1933, and to the diocese of Sheffield in 1974. Records of baptisms 1670-1987, marriages 1768-1932 and burials 1691-1997, are held by Sheffield Archives. St Thomas's Church (Beauchief Abbey), Beauchief shown on a Google Map. Places of Worship in Beauchief shown on a Google Map. Information last updated on 10 Mar 2015 at 15:40. Please also remember that whilst the above account may suggest that St Thomas's Church (Beauchief Abbey) remains open and accessible, this may not remain so. This Report was created 20 Mar 2019 - 04:19:52 GMT from information held in the Derbyshire section of the Places of Worship Database. This was last updated on 6 Feb 2019 at 15:49.